Traditional Home, the leading upscale shelter magazine reaching 4.7 million readers, opened the doors to its first-ever Southern Style Now Showhouse in the heart of New Orleans’ Uptown District from May 19-June 12, 2016. Participating designers and artists, all originally from the South, shared their contemporary vision and southern traditionalism to the 15-room Showhouse, which served as the centerpiece of the inaugural Southern Style Now design festival that took place from May 19-22. Traditional Home engaged Amerock to provide decorative hardware for interior designers of the Showhouse. Amerock worked with several designers adding the finishing touches to the living room, dining room, family room, pantry, and guest cottage bathroom. In the Southern Style Now Showhouse, Amerock’s Oberon knobs, with a satin nickel finish surrounding a frosted acrylic center, were used as the finishing touch on an accent chest in the living room. Their Golden Champagne Crawford knobs with pin tuck center detailing were used on the closet door in the family room, pantry door, and the dining room double doors. The guest cottage bathroom displayed Amerock Arrondi brushed brass towel bar and tissue roll holder. Amerock, a producer of quality kitchen and bath hardware since 1929, recently introduced 1929 Refined, eight new trend-inspired collections. The Crawford and Oberon collections used in the showhouse are just two of the new collections available in a wide range of styles and finishes to complement every lifestyle. From the understated elegance of traditional shapes to sleek avant-garde contemporary lines, a quick change of hardware gives cabinetry a fresh, personalized look. Priced from $6.99 to $13.99, the new hardware adds the finishing touches to every room. 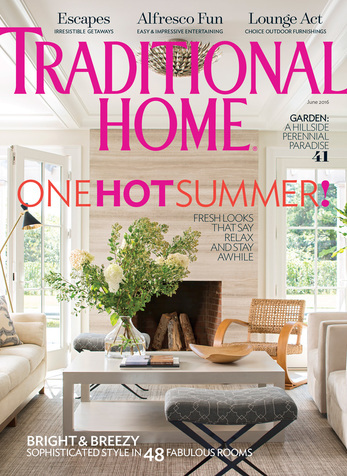 As the country’s largest upscale shelter magazine, Traditional Home inspires 4.7 million design lovers to reinterpret classic elegance in a thoroughly modern, personal way. From home, garden, and green living to fashion, beauty, entertaining and travel, Traditional Home is a celebration of quality, craftsmanship, authenticity and family – a trusted resource that respects the past, lives in the present, and embraces products designed for the future. The 2016 Southern Style Now™ festival (May 19-­22) will be a celebration of design, marked by keynote presentations, panel discussions, cocktail receptions, and dinner parties, special exhibitions, and the Traditional Home showhouse. The debut of a major annual design event, the 2016 festival will be the first of its kind in the South—offering incomparable networking opportunities, while helping one of America’s most beloved cities regain its footing as a global design capital.